The New Balance High School Championships concluded today in Cambridge, Massachusetts, with unseeded Ian Witmer and No. 4 seed Allison McCann claiming the titles. The 2016 New Balance High School Tennis Boys' Champion, Ian Witmer. North Palm Beach, Florida's Witmer, who has committed to Georgetown for this fall, defeated No. 7 seed Richie Torres 6-2, 2-6, 6-2 to win the tournament and a wild card into the ITF Grade 1 International Hard Court Championships next month in College Park, Maryland. The 2016 New Balance High School Tennis Girls' Champion, Allison McCann. The girls title went to Amherst, Massachusetts' McCann, a Dartmouth rising freshman, who defeated No. 2 seed Alexis Merrill 7-5, 6-1. McCann will also receive a wild card into the Grade 1 in College Park. Merrill, a rising high school junior, is the only finalist who is not moving on to college tennis this fall. At the $25,000 Evansville Futures event, five Americans have reached the quarterfinals, including last week's champion in Godfrey, second seed Tennys Sandgren. Joining Sandgren in the quarterfinals Friday are qualifier Emil Reinberg, the Georgia rising sophomore, No. 7 seed Connor Smith, who plays Sandgren, No. 3 seed Evan King, and Christian Harrison. Harrison, who missed more than two years with numerous illnesses and surgeries in 2014 and 2015, defeated top seed Blake Mott of Australia 6-4, 6-3. Six US women have advanced to the quarterfinals at the $10,000 USTA Women's Pro Circuit event in Austin. Texas Tech rising sophomore Felicity Maltby, a qualifier, beat No. 3 seed Katie Boulter of Great Britain 6-3, 6-3 to reach the quarterfinals of a Pro Circuit tournament for the first time. Sixteen-year-old wild card Jayci Goldsmith won her first Pro Circuit match yesterday and followed that up tonight with a 2-6, 7-6(3), 6-4 win over South Africa's Ilze Hattingh. Qualifier Ronit Yurovsky, who beat 2015 Australian Open girls champion and No. 4 seed Tereza Mihalikova of Slovakia in the first round, wild card Ashley Kratzer, who beat No. 5 seed Miharu Imanishi of Japan in the second round, No. 6 seed Alexa Graham, and wild card Josie Kuhlman, who beat No. 2 seed Connie Hsu 6-2, 6-1 in the second round, are the other US players to advance to the quarterfinals. Rain forced second round matches at the Lexington men's and women's $50,000 tournament indoors for most of the matches. Kristie Ahn lost to qualifier Greet Minnen of Belgium 6-2, 6-3, and with wild card Francesca Di Lorenzo's 6-4, 4-6, 7-5 first round win over No. 6 seed Grace Min, only Jamie Loeb remains with a chance to catch Sonya Kenin for the USTA's US Open wild card. Loeb, who defeated No. 4 seed Lin Zhu of China 4-6, 6-1, 6-2, must win the tournament to overtake Kenin, who lost in the first round. Loeb, who reached the quarterfinals of the Stockton Challenger two weeks ago, plays Minnen next. Di Lorenzo is the only other US woman who could reach the quarterfinals, with the 19-year-old wild card playing Sabina Sharipova of Uzbekistan tonight. 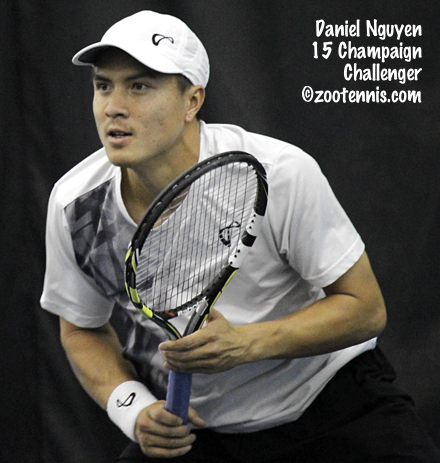 Daniel Nguyen claimed one of his best wins tonight, beating No. 2 seed and ATP No. 62 Malek Jaziri of Tunisia 6-4, 4-6, 6-1 to reach the quarterfinals of the $50,000 ATP Challenger in Lexington. Nguyen had lost to Jaziri last year in the second round of the Champaign Challenger in two close sets. Frances Tiafoe, the No. 7 seed, is also into the quarterfinals, where he'll play Mitchell Krueger, who had his best win as a professional yesterday, defeating top seed and ATP No. 68 Adrian Mannarino of France 6-2, 1-6, 6-4. Ernesto Escobedo, Alex Kuznetsov and Brian Baker give the US six men in the quarterfinals. Krueger leads the USTA's US Open Wild Card Challenge, with the $100,000 Aptos Challenger in two weeks the final leg in that contest.